Ideally, it should be possible to create a Generation Table from start to finish of this lineage, based on the hand-drawn family tree meticulously draughted by my late Uncle Alexander (Sandy) Waddell. For reasons already expressed, however, considerable doubts have arisen in my own mind, and in the minds of far more expert family genealogists than myself, as to the accuracy of this tree throughout the 17th century (1600-1700). For the moment, therefore, I'm starting with James Waddell 6th Laird of the First Line (b 1695), taking in James Waddell 9th (and last) Laird of the First Line (b 1767), and then continuing down to James Waddell (b 1846), my great grandfather, with whom the Generation Table begins in the Waddell Connection. I am very grateful to Anne Burgess for the precise dates given below for Peter Hately Waddell's family, and to Gavin Main Waddell (both via his book A History of the Waddells in Scotland, 2013 and indirectly via www.stirnet.com) in roughly equal measure for a good number of the precise dates given for earlier rows in this section of the table. By precise date I mean, of course, the day and month as well as the BMD year. 1: As per Dictionary of Proverbs, Linda and Roger Flavell, Kyle Cathie Ltd, 2008, p 180, referring to a conspiratorial message from King James I of England & VI of Scotland to Sir Geo Moore, Lieutenant of the Tower of London, using the words "quhich" and "quhat" for "which" and "what". 2: Well, that's what I thought until early December 2012. But a casual google then revealed that the current owners were in fact collateral descendants of 'Unlucky James', last of Balquhatstone of the First Line. Their line of descent therefore constituted Balquhatstone of the Second Line. But not for much longer, however, as it was at that time all up for sale, (apart from the 300 acres of farmland also gifted by the grateful monarch), as per the estate agent's website. I can assure you that had I possessed the asking price in loose change I would have hastened to buy the whole place lock stock and barrel, relocate there and live out my declining years in the ancestral atmosphere of squally rain and occasional sunny spells. But meanwhile you might care to admire Messrs Savills' sales brochure – it is guaranteed to make one sit up and take serious note of the house itself and the surrounding estate, which is all indeed extremely handsome. And perhaps a sequence of exterior and interior views snapshotted from the website. Indeed, Slamannan itself has also a most interesting historical story to tell. And not in one other respect either. 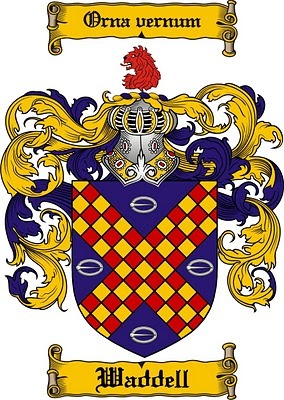 For whatever services the Waddells may have rendered the Scottish monarchy, they had also been granted a coat of arms, several versions of which I discovered during routine squirreling into the lower strata of the Web. There's a flourishing Internet trade in vanity armigerophilia, of course, but of the various possibilities this one seems the most likely. The lion's head and the motto are recognisable, as they featured on a signet my father came by in the 1950's, and the rest is heraldic fluff, really, these days. All the pomp of yesteryear is one with Nineveh and Tyre, they say, and of course, warming to their theme, the rank is but the guinea stamp, a man's a man for a' that. But it is undeniably impressive. Perhaps the helmet signifies military prowess – ironic, really, as the Waddells have never since shown any martial tendencies whatsoever. Click here to see a brief summary of heraldic terminology and a more detailed account of this coat of arms. To be absolutely honest, I'm not sure whether it goes with the original family (via the first-born son in each generation), or with the property (and therefore passed to the Second Line in 1818). But what of the earlier members of Balquhatstone of the First Line? After all, they've been delineated in Uncle Sandy's family tree, and surely it's high time for them to be collated into an orderly Generation Table too? It now becomes imperative to close the loop on the various troubling inconsistencies in Sandy's pioneering presentation, discussed earlier. At that stage, however, there were no other primary sources to consult, and no deus ex machina on whom one could rely to clear up confusions in this family narrative, beset by will-o'-the-wisps, shapeshifters, banshees and bogles. As Ecclesiastes (reputed nom de plume of King Solomon) remarked with characteristic pith "... of making many books there is no end, and much study is a weariness of the flesh". He might easily have been talking about pedigrees, as most scrolls in those far-off days were simply a catalogue of begettings. And although we family chroniclers do not bemoan this, as we want to get things right, it does become very dispiriting and discouraging to feel that our begatitudes are but platitudes. And so we are immensely appreciative of the research and scholarship of those – such as my distinguished Cousin Gavin, who has taken such care over a good many years to investigate, evaluate and transcribe the primary ancestral Waddell family records of every kind and description – from whom the rest of us can quote with confidence. Thusly, with his most kind permission, I am going public on a restructuring of those three or four preceding generations, subjoined to a complete roll-call of the early patriarchs. Chapter and verse (there's Ecclesiastes again) are provided in Gavin's magnum opus, A History of the Waddells of Scotland, Gavin Main Waddell, published privately, 2013. George 5th of Balquhatstone was offsprung from George Waddell 4th of Balquhatstone and his wife Margaret Syme. 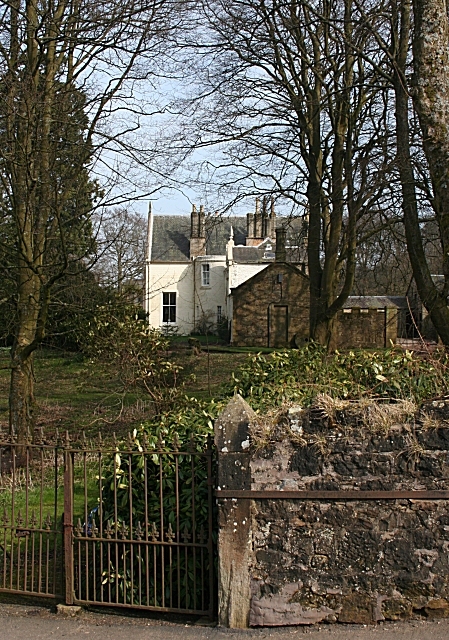 William 1st of Easter Moffat was offsprung from George 5th of Balquhatstone and his (first) wife Elizabeth Arthur. Christian Salmond was actually the (second) wife of George 5th of Balquhatstone. James (b 1625), the eldest son of George 5th of Balquhatstone, was married to Helen Ewing. His heir was James (b 1662), married to Lillias Watt and father of James 6th of Balquhatstone. There were no such persons as George and wife Robina Laing. By far the greatest casualties of this restructuring of Uncle Sandy's pedigree are the evidently mythical Robina Laing and her equally imaginary spouse, from whose younger offspring all the collateral lineages were supposed to have descended, including Balquhatstone of the Second Line. We shall see in the Balquhatstone Connection of the Second Line how Gavin Waddell's researches now account for the origins of George Waddell 2nd of Balmuzier & Ballochney and 1st of Balquhatstone of the Second Line.